The Recording is Partial Recording this week. See what love the Father has given us, that we should be called children of God; and that is what we are. The reason the world does not know us is that it did not know him. Beloved, we are God’s children now; what we will be has not yet been revealed. What we do know is this: when he is revealed, we will be like him, for we will see him as he is. And all who have this hope in him purify themselves, just as he is pure. Everyone who commits sin is guilty of lawlessness; sin is lawlessness. You know that he was revealed to take away sins, and in him there is no sin. No one who abides in him sins; no one who sins has either seen him or known him. Little children, let no one deceive you. Everyone who does what is right is righteous, just as he is righteous. Today, as we begin to look at this Gospel lesson from Luke, it reminded me of the Gospel lesson from John last week. Jesus appearing to his disciples for the first time after the resurrection. In all likelihood, they are probably telling the same story, just from two different points of views. What I mean by this, is it is kind of like hearing two stories from two different people side of an argument. They each have their own version of the events. So, as I look to Luke’s Gospel for the telling of the Disciples experience of the Risen Lord, there are a few things that I noticed that were very important in understanding the community for which Luke wrote the Gospel for. In the beginning of the Gospel of Luke, Luke is actually writing not to a whole community, but rather Luke is writing to an individual who Luke simply names Theophilus or “God Lover”. Luke, a physician, did not ever encounter the Lord Jesus during Jesus’ ministry, but rather had become a believer through the witness of the apostles. So as Luke, the physician writes this Gospel, notice what he points out when describing the experience of the Disciples of the Risen Lord. The first reaction from Jesus’ appearance among the Disciples, Luke points out the emotional response. They were startled…terrified. Luke then proceeds to tell of their rational reaction: they thought they had seen a ghost. But you know, I certainly think I can relate to the disciples in just hearing the story and think how this sounds like a good ghost story. What I mean by this is, I can imagine telling the story about this great man who used to walk the Earth healing, and telling everyone about the coming kingdom. How some people in his community didn’t like him and so they conspired to kill the man. And one day, they did, they went out and took the man and hung him on a tree. They thought they had finally rid themselves of this man, but one evening while we sitting around the table…he appears! Now a days, Ghost stories have probably become less common as we have the many horror films to choose from. You know, I am not a huge fan of horror films, and in all reality I had not watched a horror film probably for the last three or four years. But for some reason this past week, after Jackie had gone off to bed, I decided to watch a horror film. I remember now why I did not watch those movies, but I do think it helped me understand the reaction of the disciples, and the reaction of Jesus to the disciples. After watching this horror film at something like 1:30 in the morning, I had to re…..humanize myself before I felt comfortable to go to sleep. What I mean by this, is I had to watch some show that would just help me get back into reality, to reintroduce to myself that children are not possessed by a demon and trying to kill everyone. And so, I think I can certainly relate to the disciples in their reaction of fear and terror of thinking Jesus was a ghost. And so, in response to these reactions, Jesus begins to prove to them of his physical resurrection. He “re-humanizes them by proving to them of his physical self. Jesus says, “Look at my hands and my feet.” Apparently we can understand this to mean that the wounds that were given to Christ were not healed, but rather remained present. On a side note, From a medical/spiritual side of things, that in itself is quite interesting. All throughout the Gospel narrative, we have Jesus healing the blind, healing the hemorrhaging, healing the wounds of the world, but when it is he himself who has been wounded, he carries those wounds still, so that we may continue to remember and be healed spiritually through them. Jesus though then invites his disciples to touch his body, and see that his body has flesh and bones in order to prove that he has truly been raised up in a his own body, and is not a ghost or a figment of the imagination. And so in essence, Jesus is still proving to them of his resurrection. I suppose one could relate it to a magic trick. Sometimes we can’t even trust our own eyes because even our own eyes will sometimes play tricks on us. And so seeing Jesus may not have been enough for the disciples. And so, Luke writes that while in their joy they were still disbelieving and wondering. The disciples have seen Jesus, they have touched Jesus, but still they may doubt. And so finally, Jesus does the one thing that no one in that room could dispute. He does the one thing that each and everyone of us humans must do to live, he is hungry. You all may think this is a crazy way of proving to someone that you are alive, but actually I had a child ask me just this past week, what does God eat? By Jesus requesting something to eat, by Jesus hungering, and then taking a piece of fish to eat in the presence of the disciples, I suppose you could say it was irrefutable evidence that this was no ghost, but truly Jesus was raised from the dead and is a live in a bodily form. Jesus successfully re-humanizes the disciples to see, touch, think, and believe that Jesus is resurrected from the dead! So I don’t know if you caught what I caught in these words, but I find it kind of humorous if you think about it. Jesus has appeared to the disciples, whom they thought of him as a ghost. Jesus had to prove to them by sight, touch, hearing, feeling, and then even had to watch him eat in order for him to prove to them that he is resurrected. And yet, after his teaching them of all that is said in scripture, Jesus gives them the responsibility to spread the news that “repentance and forgiveness of sins is to be proclaimed in his name, in the name of the RISEN savior to all nations, beginning from Jerusalem.” They, the disciples have been given the task of spreading the good news, the gospel, of telling everyone beginning with the people of Jerusalem who rejected Jesus, that because he lives, repentance and forgiveness of sins is to be proclaimed. But yet, they themselves will not have a Risen JESUS who will walk, talk, and prove to others by eating in front of them. The task of being witnesses to all of these things seems absurd! How do the disciples do it? How can we continue being witnesses of a resurrected Jesus when we can’t tell our friend, Hey come to church and you can put your hand in the side of Jesus to prove to them that He Lives!? I can tell you how they do this, and I try to tell everyone how they do this every day of my life. The answer to this question is actually the answer that our new Bible Study has been studying. Let me quote from the book we have been reading to answer this question. “Jesus himself, backed up by the early Christian writers, speaks repeatedly about the development of a particular character.” Character being defined as the “transforming, shaping, and marking of a life and its habits.” In other words, the Church proclaims Jesus’ resurrection with our bodies, our minds, and our souls. We, through the grace of God, proclaim Christ’s Resurrection in the way that we live, in all the choices we make, in the way we spend our time, our money, in the way we speak to one another. The habits that we form speak to how we proclaim and are witnesses of the Resurrected Christ. Believing in the Resurrection does not sometimes come with transformation pieces of our lives, it ALWAYS comes with the transformation of our whole lives! Every aspect of our life should speak to the Resurrection! This is exactly what our lesson from 1 John is speaking about: 1 John says, “You know that he was revealed to take away sins, and in him there is no sin. No one who abides in him sins; no one who sins has either seen him or known him.” Because we have seen, because we believe, we must strive to live our lives in ways that glorify him. If we have not, we must come to confess our sins before him and one another. Each and every week we offer up our confession because we know that we try, and we try, but we continually turn our backs on God and on the love that he showed us through the cross. And we are a people who desire to abide with God and so we confess our sins ever before God. John Wesley preached a sermon on not weekly communion, but Constant Communion. If we continually are in communion with God, we are continually placing our lives ever before God. The Elder who wrote 1 John says, “And all who have this hope in him purify themselves, just as he is pure.” We who desire God, who hunger for God, must seek to purify ourselves as we claim witness to the Resurrection. But how does one purify themselves? Jesus told us the greatest commandment is to love thy Lord your God with all your heart, with all your soul, with all your mind, and with all your strength” (Luke 10:27, Matt. 22:37, Mark 12:29-31) Wesley in his sermon ‘The Scripture Way of Salvation’ writes, “For as long as love takes up the whole heart, what room is there for sin therein?” To reflect on these words from Wesley, if we love the Lord our God with all our heart, with all our soul, and with all our mind; then where is there any room for sin to remain within us? The issue of our ability to purify ourselves is not that God has not given us the ability. God has given us everything that we are in need of through his Grace, we just have to claim it. We have to make it priority in our lives. We, with God’s grace, must simply do what Jesus commanded: Beginning in Jerusalem, we must go and be witnesses to the nations of repentance and forgiveness of sin, in the name of the Resurrected Jesus, and do so by developing Christian Character with your whole Body, Soul, and Mind. 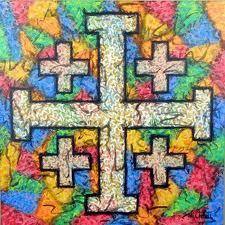 To close our sermon today, you have been looking at this picture of the Jerusalem Cross throughout this sermon. This cross has a lot of significance and is a cross that is seen all throughout Jerusalem when you go to the Holy Lands. The meaning behind this cross is that the large cross in the center represents Jerusalem where the cross was. The four other crosses is to represent the Gospel message being spread in all directions. And so, beginning in Jerusalem, and to the nations, let us take the message of the Cross, repentance and forgiveness and proclaim it forevermore. Amen. Wright, N. T. (2010-02-14). After You Believe: Why Christian Character Matters (Kindle Locations 197-198). Harper Collins, Inc.. Kindle Edition. Wesley, John. “The Scripture Way of Salvation.” In John Wesley’s Sermons: An Anthology, by Albert C Outler and Richard P. Heitzenrater, 379. Nashville: Abingdon Press, 1987.